Fantastic product. 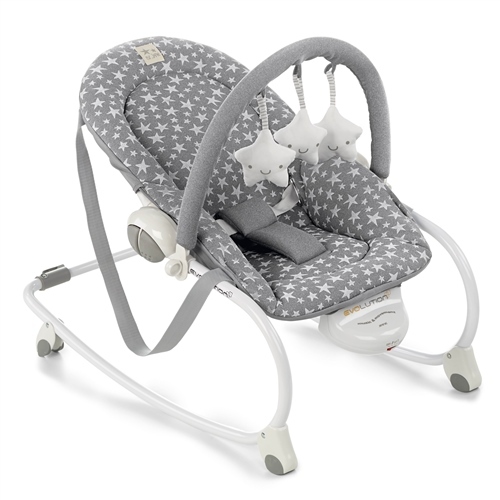 My 16 week old has silent reflux and most bouncer type chairs are not upright enough for her and can cause her to have acid flares. We have no such issue with the Jane Evolution, it has 2 back rest positions which are both angled enough to be comfortable and supportive but still allow a good amount of movement or a restful nap. Its very well padded and sturdy yet quick and easy to dismantle for carrying. We had the Fisher Price Birth to Toddler rocker with our eldest child and it wasn't a patch on this. Very impressed and well worth the higher price bracket. Lovely item, though not sure what the straps at the sides are for. Item is well made, well designed and easy to fold. Daughter seems very happy with this chair, though wish it could be adjusted for a couple more positions. Would definitely buy Jane branded items again. Very pleased with the speed at which this product arrived to us. Baby is yet to arrive but this product looks fantastic, as with all Jane products. Very well made, soft seating & brilliant design that can be put at different angles. Very impressed.